Would you like to make a gift of this learning to the people you love? Gift certificates for any BayNVC-sponsored training are available. You may also give someone a sum of money to use in learning NVC with us in whatever way they choose. Contact our office (510-433-0700) or via email at nvc@baynvc.org. We encourage you to order from your local independent bookstore. You can also purchase it from bookstores via Alibris.com. If you would like five copies or more, you can get 40% discount (off the $25 cover price) by ordering it from us. For eBooks: You can purchase a Kindle version here. For an epub version ($9), please contact us. You can also purchase a copy at Amazon, however we have concerns about their labor practices and encourage you to learn more about it so that you can make informed decisions. We encourage you to order from your local independent bookstore. You can also purchase it from bookstores via Alibris.com. You can order five copies or more, at a 40% discount (off the $9.25 cover price) from us. 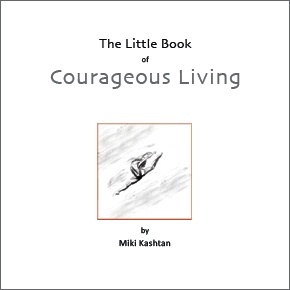 Many of you have heard Miki’s radio program “The Conflict Hotline,” the call-in radio show that aired on KPFA between 2004 and 2006. We are very excited to announce that excerpts from this radio show are now available in a two-CD set. We picked a variety of situations and subjects enabling the listener to witness the power of NVC in action. 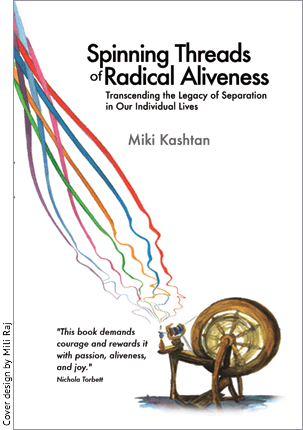 In her interactions with different callers, Miki models empathy, authentic and vulnerable expression, guidance, and coaching. Where relevant, she also shares examples and stories from her own life experience. Please note: this is now a digital download ONLY. No physical CDs will be shipped. 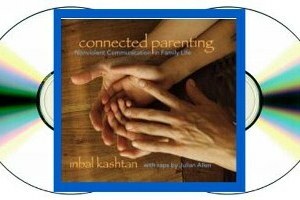 “Connected Parenting: Nonviolent Communication in Family Life” is a recording of an introductory workshop given by Inbal Kashtan in 2004 to a statewide parents’ conference. The CD covers the core principles of NVC (for example, all actions are an attempt to meet needs), some key distinctions (such as the difference between needs and strategies), and a wealth of questions and stories that are specific to parenting: working with “no”; shifting from guilt, shame, and rewards/punishment to open-hearted communication and mutual understanding; cultivating responsibility and consideration for others; nurturing compassion for ourselves when we fall short of our values; and transforming parenting to become a path toward peace in the world. You can read more about Inbal’s approach in her article at The Natural Child Project, and you can also read the first chapter of the booklet Parenting from Your Heart: Sharing the Gifts of Compassion, Connection, and Choice by Inbal Kashtan. Please note this is an audio download; no physical CD will be sent. 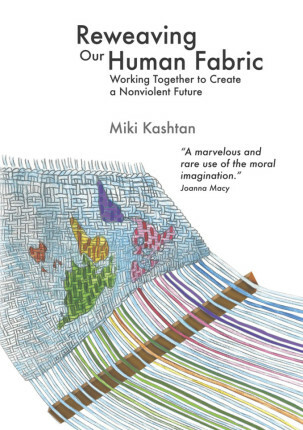 One of Miki Kashtan‘s core offerings in the world is the process of Convergent Facilitation which she developed to apply the principles of NVC to the task of supporting groups in making collaborative decisions. This process has been used in dozens of settings by now, and has proven robust. While we are awaiting the possibility of finding a publisher for the manuscript Miki has written, we are making available to folks who want a basic introduction a packet that provides the core principles and flow of Convergent facilitation. It is surprisingly and reliably possible, often easy, to find agreements on principles in the midst of disagreements on positions. When we trust that our needs and concerns matter, and understand the needs and concerns of others, we can feel the difference between compromise and shift. While we may only encompass a narrow range of solutions on the basis of preference, we can embrace a wider range on the basis of willingness. We become amazingly creative when we transcend either/or frames and aim instead for solutions that work for everyone. In support of the enormous amount of resources and effort that have gone into creating these materials, we ask that you give at least $25 for this packet, and more if you can support us in this way. At the same time, we are committed to making resources available to people regardless, so if you are unable to give this amount, we ask that you give any amount that you are able and willing to give without hardship to you. Unfortunately, because of the particular plugin we use for processing these purchases, we are unable to offer a full gift economy. Please consider your needs and ours as best you can when choosing how much to give. Miki Kashtan is celebrated by many participants in her workshops for bringing them experiences of NVC that support real integration of the core principles of NVC. This shift from how to why allows for a level of fluency that helps connect her with audiences in various settings and cultural contexts. Miki is making available the materials she developed in support of this approach to teaching. She is also offering monthly calls that you can join, offered as a pure gift without any money exchange, for coaching and community building with others who are trying to share NVC in this way. If you would like to support this work, please consider joining her Circle of Support by clicking here. We ask that you give at least $30 for these 80+ pages. At the same time, we are committed to making resources available to people regardless, so if you are unable to give this amount, we ask that you give any amount that you are able and willing to give without hardship to you. Unfortunately, because of the particular plugin we use for processing these purchases, we are unable to offer a full gift economy. Please consider your needs and ours as best you can when choosing how much to give. 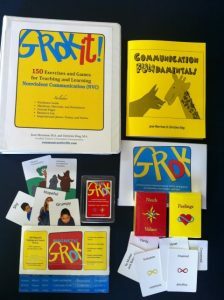 Check out these communication materials and products that many of our trainers use.